Whenever I'm shopping for Presley, I get really excited when I find the same (but bigger) outfits that she wore when she was younger. She's growing so fast that it just takes me back to the days where she was a fat, bald, snuggly little butterball. 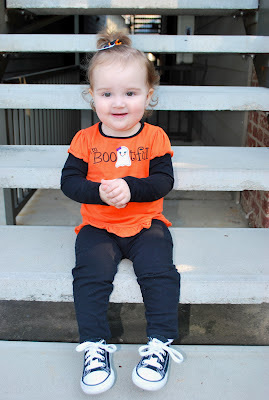 When I was at the consignment sale in Montgomery I found a halloween shirt that was the same as a onesie we had last October. It's crazy to me how much she has grown in just a year! See! Have mercy, I can't even take it. How about that bow? Yeesh.